Home Companies Zhonglan Industry Co., Ltd.
We are Manufacturer and always supplying Organic Acid / white EDTA ACID powder 99% used as additive in Daily chemical with competitive price,high quality and regular basis. 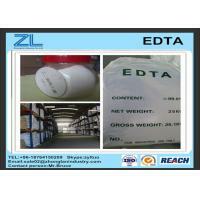 We have produced EDTA series products more than fifteen years., 80% products are for expoer . Our main market is in USA , Mexico , Holland , Belgium , Japan , Korea these developed country .